1961: John Graham dies in London England. "The Russian-born artist John Graham (1881-1961) had so many strings to his bow that his gifts as a painter were somewhat underexercised. A brilliant if crotchety theorist and critic, he wrote an insightful treatise, System and Dialectics of Art (1937), that prefigured Abstract Expressionism. A keen promoter of talent, he was the first to recognize Jackson Pollock and Willem de Kooning, and he influenced David Smith's decision to concentrate on sculpture. A connoisseur, collector and dealer, he helped to expand the interest in African and Oceanic art in this country. He was also a yoga practitioner, a linguist, an amateur anthropologist and a mystic. As a painter, he was far from prolific, but he understood thoroughly the language of Cubism, and he reaffirmed its validity for the younger generation of Gorky, de Kooning and Pollock at a time when American Regionalist painting had a powerful grip." "John Graham, born Ivan Gratianovich Dombrowski in 1886 in Kiev, was a man of many parts and even more words, who talked as much as painted his way into the history of 20th-century American art... Graham's artistic development began in earnest after he reached New York in 1920 - to the late 50's... Married four times, he has been characterized as a womanizer, but it seems more complicated than that, starting with the fact that he often stopped painting when he was in a relationship. His greatest love may have been Marianne Strate-Felber, Ileana Sonnabend's mother. They met in 1943 and lived in Strate-Felber's brownstone at 4 East 77th Street, in the apartment that eventually became the gallery of her son-in-law, Leo Castelli. When Strate-Felber died in 1955, Graham was desolate and embarked on a series of troubled, often obsessive relationships (and accusatory correspondences) with younger women, including Isabelle Colin du Fresne, the Frenchwoman who would become Andy Warhol's superstar Ultra Violet. He died in London in 1961." 1961: Robert Motherwell begins to make prints. 1961: Rothko sells eight paintings. [Note: Burton and Emily Tremaine purchased Maroon on Blue from Janis the same year that Janis purchased it from Rothko. 1961: Peggy Guggenheim sues Jackson Pollock's estate. 1961: Adolph Gottlieb is awarded third prize at the Pittsburgh International Exhibition, Carnegie Institute, Pittsburgh, PA.
January 1961: Ben Heller buys Barnett Newman. January 18 - March 12, 1961: Mark Rothko exhibition at The Museum of Modern Art. February 1, 1961: Barnett Newman's brother dies. An article on the Bleecker Street Tavern murals can be found here. February 1961: Mark Rothko visits Dr. Grokest. February 26, 1961: Artists denounce The New York Times art critic John Canaday. Spring 1961: Barnett Newman battles Erwin Panofsky in Art News. April 13, 1961: Franz Kline is admitted into hospital. April 14, 1961: Willem de Kooning buys more land in the Springs. April 25, 1961: Franz Kline hangs a show. June 21, 1961: Franz Kline buys a townhouse. September 1961: Barnett Newman offers $500 to the Carnegie Museum of Art. While he was in London, Rothko met Italian collector Count Guiseppe Panza di Biumo who was interested in purchasing five of the Seagram murals. By October 1960, the Count owned one Rothko - by September of 1961 he owned six and had expressed a desire to devote his collection in his Villa Litta (in Varese) "almost exclusively" to Rothko's work. During their meeting in London, Rothko agreed to sell him additional paintings to be selected when the Count was due to be in New York in late October. October 18-December 31, 1961: "American Abstract Expressionists and Imagists" at the Solomon R. Guggenheim Museum, New York. The exhibition included Barnett Newman's Onement VI. "My hat goes off to the Impressionists because they moved into a new subject matter. They insisted that their subjects be chosen from secular life but claimed that they were as important as any crucifixion. This was a stupendous step." c. Late 1961: Willem de Kooning punches Clement Greenberg. "In actuality what happened was that I was with Jim Fitzsimmons and Kenneth Noland, and Bill came in with a couple - new people to me - and they went to sit in a booth. We were at a table. He left his companions and came over to me and said, 'I heard you were talking at the Guggenheim and said that I'd had it, that I was finished.' Well, yeah. I had said that. Sure. I meant it too. And I still think that he was finished. He hasn't done a good picture since 1950 or '49. Anyway, Bill sat down with us... He just left his companions sitting alone in the booth. That was Bill. He was a barbarian like his wife, Elaine... no manners. Supposedly manners went out in the sixties, but at the Cedar Street Tavern they went out long before that. From Blam! The Explosion of Pop, Minimalism, and Performance 1958 -1964 by Barbara Haskell. "'The Store' took the form of brightly painted plaster reliefs of everyday commodities - shoes, foodstuffs, fragments of advertising signs. Suspended in the stairwell and front window of the gallery like a random display in a messy shop window, 'The Store' manifested Oldenburg's increased involvement with commercial and manufactured objects. In contrast to the charred and torn relics of his 'Street,' these plaster reliefs were blatantly commercial in subject... it was about buying and selling. 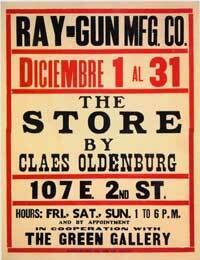 The poster advertising the second version of Oldenburg's "The Store" gave the address as 107 E. 2nd Street - Oldenburg's studio - and the dates of the exhibition as December 1 to 31 although it was extended through January. (CO201) Oldenburg came up with the idea for "The Store" while driving around New York City. One of the visitors to "The Store" was Andy Warhol who would recreate his own choice of a foodstuff on canvas - albeit a more realistic representation of a foodstuff - a soup can. December 1961: Mark Rothko donates Number 19, 1958 to The Museum of Modern Art. Late 1961/62: Willem de Kooning has an affair with Marina Ospina.